First Lady Michelle Obama hosted an education roundtable in China telling professors, students and parents on Sunday that she wouldn’t have risen to where she was if her parents hadn’t pushed for her to get a good education. Michelle Obama hosted the discussion about education on the third day of her visit to China aimed at promoting educational exchanges between the two countries. “Education is an important focus for me. It’s personal, because I wouldn’t be where I am today without my parents investing and pushing me to get a good education,” she. Michelle Obama said she and her husband, President Barack Obama, wanted as many young people as possible in the US and the world to have access to education. 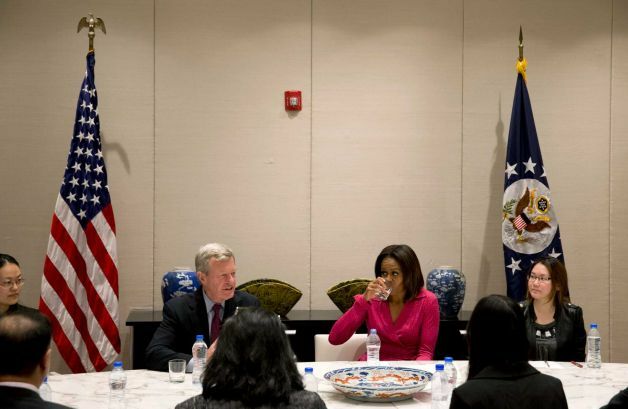 She hosted a roundtable with a handful of Chinese professors, students and parents at an event at the US Embassy in Beijing that was attended by new US Ambassador to China Max Baucus and closed to media. Michelle Obama plans to visit the Great Wall later Sunday and have lunch with her mother and daughters at a restaurant in a former school near a section of the wall. On Saturday, Michelle gave a 15-minute speech at China’s prestigious Peking University in which she promoted the free flow of information and freedom of speech, the only time during her trip that she has brought up a contentious issue. China routinely filters out information deemed offensive by the government and silences dissenting voices. Those remarks by Michelle Obama were absent from China’s state media but were circulating in social media, where they were widely praised. Michelle Obama’s trip, the first time a US president’s wife has independently visited China, also has given her an opportunity to engage with President Xi Jinping’s wife, Peng Liyuan. Michelle Obama will visit Xi’an and Chengdu cities before returning to Washington on Wednesday.